Humanoid Aliens – How Much Likeness Is Plausible? The idea that intelligent aliens are somehow similar to us in basic physical make-up has occupied both scientists and fiction writers immensely. And it’s understandable why, after all, when we look at the sky, we’re looking for kindred spirits, potential allies, a new mirror to gaze into and understand our place in the Universe. But will what we see really resemble us? 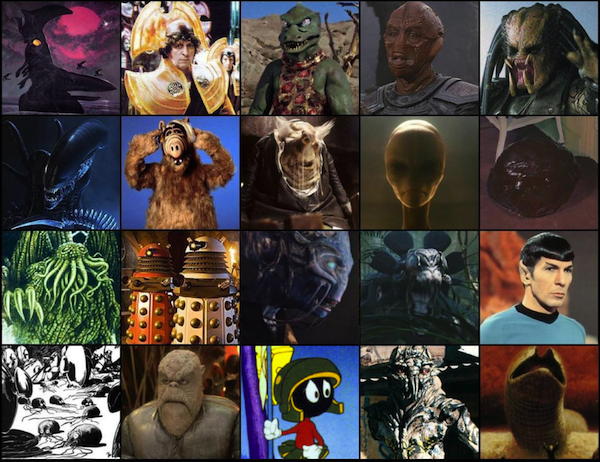 TV series and movies are full of them, and most written science-fiction as well: humanoid aliens. But how plausible are they? From an evolutionary perspective, we have become the dominant species on Earth because we were the most adaptable, versatile and social species. We used tools to achieve things other species—probably smarter, faster and more resillient than us—could not. We used speech to coordinate and plan activities that not even the most strategic pack hunting predators could match. We used speech to teach future generations, thus eliminating the tedious trial by error and significantly reducing adaptation times. And we used our abilities to dominate our environment. We used our brain to coordinate all our other abilities to the sole purpose of reaping the benefits off of everyone and everything around us. We bastards. But what about sentients evolving on other planets? What about our most basic physical characteristics, the ones that set us part form our potential alternatives here on Earth: homeothermic metabolisms (we’re warm blooded); bipedal, upright locomotion; bilateral symmetry; a morphology consisting of head, trunk, two arms and two legs; opposable thumbs; and stereoscopic vision. Would aliens have these same basic characteristics? Do they have to, in order to have functional societies and technology? Scientists have argued both in favor and against such similarity. When it comes to extraterrestrial life, all we have is speculation and the admission that even our imagination has limits (based on what we conceive as plausible). Some say the ability to use tools is essential, and being able to move swiftly on any type of ground is essential as well. Thus two arms with opposable fingers, and at least two legs, are a must. Others say that depending on the planet of origin’s environment, more limbs might be absolutely vital (for example on a high-gravity world, where two bulky, stocky legs are far less efficient than four or even six slender ones). As to the opposable thumbs, these imply the existence of an endoskeleton similar to ours. But what if an alien species has a cartilaginous skeletal structure? Their fingers would be highly flexible. They’d do with only three fingers, being able to oppose them at will, or not. Or wrap them around objects multiple times. Or if they had an exoskeleton to protect their vital organs, and their appendages were entirely made of skin-covered muscle? Can’t get any more dextgerous than that. There are other characteristics of humans which seem to find their way into fiction, no matter how many limbs the aliens have. The most prominent ones are forward facing eyes (mostly two), and mouths (including some sort of breathing apparatus). But how necessary are they really? And how much do they have to resemble ours? Take the eyes, for example. Our eyes are fairly primitive, compared to those of other creatures. Just look at the compound eyes of dragonflies, which give them 360° vision that is extremely sensitive and color-receptive, and has highly accurate movement perception. Or take the incredible depth perception and precision of birds of prey. Or the almost alien ability of sharks to “see” the electromagnetic energy generated by twitching muscles. We have even more creatures with incredible eyes right here on Earth — like the fascinating Four-Eyed Fish with its split eyes that can see both below and above water at the same time; or the Mantis Shrimp with its unparalleled double trinocular vision; or the unfortunately extinct Trilobite with its compound eye lenses made of freaking crystal (the only earthly creature with inorganic eyes, apart from pirates). When it comes to eyesight, it looks as though we drew the shorter straw. Even grazing mammals have better eyesight than us. Our pets have better eyesight that us. Imagine what we could have achieved as a species if we had a much superior eyesight. Or… would that really make any difference? Eyesight isn’t everything. There are plenty of creatures with eyes that can’t see squat, and very successfully rely on other senses for orientation. And what about mouths? Are they vital? Even invertebrates have mouths. 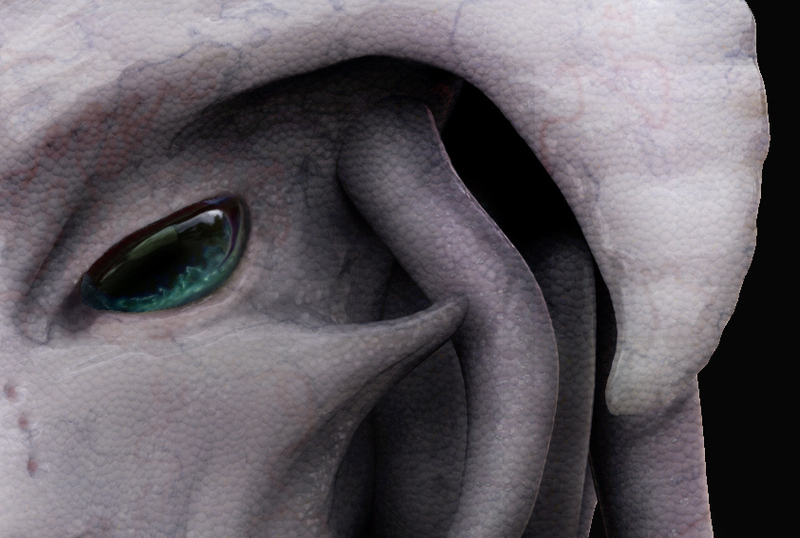 Any creature that could be considered a potential basis for a speculative intelligent alien life-form has some sort of mouth — an internal gut cavity lined with gastrodermal cells, capable of extracting nutrients from ingested matter. Okay, there’s one creature here on Earth that has absolutely no digestive tract: Olavius algarvensis — a marine worm that nourishes itself with the help of endosymbiotic bacteria. But other than that, all creatures we know of have mouths of one shape or another. So while we can definitely conclude that both eyes and mouths are vital for a species to become dominant, or at least to be considered evolved, these really don’t have to be anything close to human eyes and mouths. In fact, our eyes and mouth are decidedly at a disadvantage compared to other species here on Earth. I think intelligent, evolved aliens will undoubtedly have some broad similarities to humans—the ability to use and create tools, the ability to pass on knowledge (thus communicate through time), and the ability to dominate their environment and manipulate it to serve their own needs on a grand scale. These will mostly be based on their dexterity, the accuracy of their vision, and their ability to communicate. But when you look closer, they will likely be starkly different from us. In fiction, we are at full liberty to create aliens that are as alien OR as similar to us as possible. All we have to worry about is logical consistency and a smidgeon of scientific plausibility. And let’s not forget that our fantastically alien (or humanoid) aliens have developed their own technology, potentially far superior to ours. They could have intervened in their own evolution, tailored their genes, embedded technology into their bodies, or even posess entirely mechanical bodies (uploaded minds) thus gaining immortality. Their appearance may be drastically different from what evolution can account for. The possibilities are endless, only limited by our own imagination. That’s why I love science-fiction so much. I love creating aliens that share some features with humans, maybe even offer the illusion of being humanoid, but who function very differently from us. In my novel The Deep Link, the alien co-protagonist Amharr is fairly humanoid at a first glance, having two forward-facing eyes, a torso, and two arms with opposable fingers (albeit six, with cartilaginous bones), but that’s about all the similarity there is. He has no mouth and no gastro-intestinal tract. He has two pair of very different legs which he can use alternatively. He speaks via sonar, tastes the air around him with several mobile feelers, and has embedded nano-technology that has been used in his species for millennia and has greatly modified their metabolism, their nervous system, and even their skeletal structure. There are quite a handful of apparently humanoid species—but with fairly inhuman functions—in The Deep Link, along with some species that are completely alien. I think the mixture is the most interesting, and also the most plausible. I find it hard to believe our universe birthed ONLY humanoid sentients, just as hard as I find it to believe that we are so unique, no other sentients look anything like us. Is it plausible for evolved, intelligent aliens to have some basic similarities to us? How much are you willing to accept in terms of humanoid traits in aliens? I do not believe that intelligent aliens would have similarities to us. But then again, using the word ‘humanoid’ imply that they have to be similar to us in body shape. Humanoid aliens is a invention from writers and film makers, who loves to make humans and aliens alike, to allow all the bad, funny, scary part of being ‘human’ show – with all the twists plausible from alien beings. Aliens, from another planet, the composition of environment would be different, gravity as well, and the first life form might not even have conventional skeleton structure. And if they are intelligent, one more thing not in common. I don’t consider the human race intelligent as a group – despite a few individuals parting from the crowd. I am willing to accept a lot – but if humans and aliens coexist – how to make a plausible story – can they communicate together, even be in the same room (oxygen based lifeforms?). Tools – plausible – as in a life form that learn to use tools, evolve to a new level of abstraction and way to change its own environment. Technology, plausible, particular if they have to move in outer space or communicate with humans. Humans unique? That is a scare thought. I hope the universe has more to offer. And I serious believe it has. It is likely dense with life forms – but dense as in light years between – and no way to easy to find. At least not yet with our limited level of technology. Aliens who resemble us enough that we can stitch a way to communicate or even cooperate are quite improbable, but not impossible by any scientific extrapolation or speculation. And science-fiction clings to that tiny chance and uses similarities to enable readers to empathize (and even sympathize) with aliens. Such aliens are a very powerful fictional tool. When it comes to actual science, though, we have not even come close to discover another intelligent life-form on a habitable world or in a space-ship, and that is, in part, because our very definition of “habitable” and “intelligent” is tremendously biased and nearsighted. Who says aliens have to be humanoid or even breathe oxygen? In John Christopher’s Tripods trilogy, the Masters, the invaders of Earth, had green air and water. Oxygen was poisonous to them. They weren’t even human or humanoid. They were 7′ tall and had tentacles. The color green should give you a clue. What gas is green? Chlorine. According to the late Stephen Jay Gould, the only stable isotope of fluorine is Flourine-14. Would it be possible for humanoid aliens to evolve on a planet with either a chlorine, or fluorine atmosphere? It’s possible. Is it likely? I don’t know. Maybe. Fascinating. Great blog. I agree totally with you, but in writing if you want an alien the reader can connect to, there has to be a mental or physical bridge. Something too different and alien is hard to be sympathetic with. As the enemy, however, and to create a negative response in the reader, having an alien with extreme features may be interesting. I am constantly amazed at the creatures we have right here on Earth that appear and act alien. They provide rich ideas for scifi stories. Who knows what we might eventually find out there in the starry universe? Peter Hamilton’s Immotiles (&Motiles) are the first thing that comes to mind in terms of truly alien antagonists. They were utterly terrifying — and I loved them for it. Anything is possible. However, human like aliens are necessary for fiction so the reader can relate to them on some level. Highly strange sci-fi has a very limited readership. Anthropomorphic characters resonate with readers. If you want to be read go with the market norms. If you’ll notice even very odd aliens have human qualities like the acid spiting rock eater in one episode of the old Star Trek TV show. She was just protecting her young, a very human thing to do although it was in no way human like in appearance. No humanity means much less reader interest. I like the picture of Amharr. Whenever I read books I wonder if my vision matches what the writer intended. In science terms human like aliens are not likely. But I think it’s fun to have them. Coming up with odd aliens is also fun. Such as my slug race who communicate through bioluminescence. Still haven’t figured how to work them into a story yet. For most science fiction fans, the first priority is an entertaining story. However, there are times when a “smidgeon of scientific plausibility” is too small and readers will not feel that the imaginary alien could exist. An author is in danger of creating a fantasy alien and they might as well be writing a fantasy story about elves or flying dragons. One assumption that we often make is that each planet in the universe exists as its own isolated island with its own unique evolutionary outcomes. However, some science fiction writers have explored other possibilities. What if there was a “first technological species” on some planet, possibly a few billion years ago. What if they long ago spread their mechanized probes out through our entire galaxy and took control of the evolution of life on all the planets in our galaxy that support life. What if they used their nanotechnology to shape every evolving life form in our galaxy during the past 2,000,000,000 years, forcing all “sentient life forms” to have the same basic body plan? That’s a known and well accepted theory in sci-fi (just look at Stargate), but from a scientific point of view, it’s more unlikely than life evolving very differently each time it creates sentient beings. I have found creating humanoid aliens with wings to be REALLY…. REALLY hard. Humanoids aren’t designed to fly… at all. Even if you mess with the environment (lower the gravity and make the atmosphere more dense), you run into other problems that have to do with breathing and many more (in a 1g environment they would be VERY weak, nevermind the fact that they may not be able to make the tech we can at 1g). So I did the one reasonable thing I could do… make stuff up. As in unobtanium on their planet, which dampens the gravity around them in a ten ft radius if they carry the rock. This allows them to fly with wings that are only as long as their arms. In fact, when carrying the unobtanium, they are lighter than air and float like balloons. Wings just helps them to direct where they want to go, even though they have to fly zig-zag to avoid floating up, or else just fly at angle toward the sky or the ground. It’s not called “suspension of disbelief” for no reason. Science fiction’s great appeal doesn’t lie in the probability/likelihood of its most imaginative things to actually come true, as much as it lies in letting one’s mind wander through worlds that don’t exist, meet creatures never before conceived, and do things considered to be impossible now, and having them explained in such a way as to disable our critical eye. That’s suspension of disbelief to me. I can enjoy the most implausible things, if they’re explained in such a logical and consistent way as to make total sense in that story world. It’s like creating new laws of nature. You can go against actual physics if you do so in an informed, internally consistent and logical manner. I never was like that, and am not like that now. Yet I do like to point out things when I see them, especially if they need some clarification. Human eyes aren’t so much of a short-stick as you might think. Dragonflies can see movement great (yes, I researched dragonfly vision extensively online long before we met), but their vision is not as clear as it is for humans. They use compound eyes, which are better at detecting movement than showing clearly detailed pictures. Many animals lack color vision, and while Eagles have better long range focus, they also see colors in the ultraviolet range, so that rat urine shows up like a red flag to them from a mile up so they can attack. We literally have no idea (yet) how eagles perceive colors in the ultraviolet range. Other animals like cats and dogs lack color vision, but they do have tapetus lucidum (an inner mirror behind the iris that makes their eyes shine in the dark when light hits them). This ability makes them better able to see stuff in the dark than humans can, but for cats also seems to make their day vision pathetic (can’t see clearly past 20 ft, everything past that is blurry). In fact, cat’s see thing clearer in the dark apparently because there is less light reflecting off their mirror lens and their eye is made to absorb a maximum of light in dark environments (unlike us humans). In conclusion, every animal has a form that is best suited for function. Dogs/horses have long muzzles usually, so that no matter where they go they see their nose. Humans don’t have to worry about that, probably because eating is the main concern for humans all day long (like it is for animals). Horses can’t even see stuff in the middle, they have binocular vision, meaning the middle is a blind spot. That is why they have to look at the ground so as not to hit anything close up. I used to think about making aliens that look like raptors, but I thought against it having a raptor like head because a head like that would see it’s nose ALL day long. Works fine for animals who care mostly about food, but intelligent aliens would literally have a huge blind spot every time they try to work with their hands. The only solution to this would be to change the head (shorten the muzzle) or place the eyes at the tip of the muzzle (weird but if that’s what you want go for it). Ultimately it’s the limits of the imagination that count. I just like to see what happens when we mix reality with fiction, since that is what I intend to do. I look at all the implications I can think of when I make aliens or fictional tech. For example, I made gravity dampening tech so starships could fly off a planet using less thrust power. A high end showing for this tech would be using it to move entire planets with engines, even through hyperspace. Yet in order not make things too easy, I ensured that my hyperdrive has some limitations. Dropping a planet with an atmosphere into hyperspace is a no-no. Why? It would ignite nuclear fusion all across the atmosphere. Starships don’t have this problem since they are designed for hyperspace. Planets are not. Thus moon-like planets would work just fine. The existence of life in the universe is highly dependent on the nature of how the universe arose, how the cosmos evolved, how life arose, and how biological evolution actually occurs. Due to the anthropic principle and the fine tuning of the physical constants of the universe, both cosmological and biological evolution are contingent upon the physical laws of nature that are exactly matched for biological life as it is on Earth. Many atheists allude to concepts such as cyclic universes, bubble universes, and multi-universes to avoid a transcendental cause to the creation of our universe 13.8 billion years ago. That is they wish to avoid the reality of God and creation! Their problem is that their mathematical models, based on inflationary theory and string theory, leads to elaborate theories that can never be verified empirically and result in even greater fine tuning then that which is actually observed in our universe, which in turn defeats the purpose of the whole exercise! Also it has been mathematically proven through the BGV theorem that there can be no infinite regression of past time and at some point there is a transcendental cause to the creation of the universe with its anthropic fining tuning for life as we know it on Earth. How life arose is the second biggest question, there are different theories such as DNA first, RNA first then DNA, and metabolism first followed by proteins, then RNA and then DNA. Some scientists hold to the idea that whatever process life arose by, it was completely random (rare Earth postulates), while others hold to biological determinism, that life arose automatically when conditions were right (life is abundant postulates). This is supported empirically by life arising on Earth immediately after the cessation of asteroid impacts. This biological determinism indicates that some natural law exists that arises from the fundamental laws of physics to give rise to and direct the emergence of life on Earth. The concept of biological evolution dates back centuries to the ancient Greeks and has been elaborated upon through the centuries. Prior to Charles Darwin, naturalists held to concepts of biological evolution rooted in structuralism, formulism, and vitalism. Charles Darwin postulated in the Origin of Species, that the mechanism of evolution has three components; common ancestry, natural selection, and random mutation. This is commonly referred to as “Darwinian Evolution”. With the discovery of DNA, a revision was made resulting in “Neo-Darwinian Evolution”. Examination of the genetic structure of living organisms proves conclusively that all life on Earth is related and stems from a common ancestor. However scientific evidence is amounting that the other two components are not likely to occur. The second component of Darwinian and Neo-Darwinian evolution, natural selection, is supposed to be completely random and occurs steadily and gradually overtime. This is not supported by empirical evidence. Gould’s theory of “punctuated evolution” fits the fossil record with periods of very slow evolution of flora and fauna that are punctuated by fast periods of evolution. This is clear evidence that biological evolution is contingent on the laws of physics, how life originally arose, on the physiology, morphology, and biochemistry of the common ancestor, and sudden changes in the environment allowing for the development of biological niches and new life forms. Also it has been found that the evolution of organic and inorganic systems is not only contingent on prior conditions and causes but is directional in nature! Dr. Adrian Bejan, a professor of mechanical engineering, and specialist in thermodynamics, has formulated a third law of thermodynamics known as “Constructal Law”. This law governs all systems, both inorganic and organic, giving directionality in the evolution of systems! Both cosmological evolution, the origin of live, and its biological evolution are governed by this third law of thermodynamics! This third law has been proven by Dr. Adrian Bejan with empirical evidence. It supports both the concept of biological determinism in the origin of life and prior concepts of structuralism and formalism in the evolution of biological life. It also supports the concept of directed evolution as postulated by Dr. Michael J. Denton in his book Nature’s Destiny: How the Laws of Biology Reveal Purpose in the Universe. Dr. Denton is a medical doctor and genetic researcher who adheres to concepts of structuralism and functionalism in both the micro and macro evolution of life. He, along with others, rejects the concept of purely random mutation in the evolution of life. The third component of Darwinian and Neo-Darwinian evolution, holds that both micro and macro evolution is the result of purely random mutation. Implicit in this is that random mutation occurs that can lead to both decreases and increases in genetic complexity, which in turn results in decreases and increases in macro complexity of the systems of living organism. Also implicit in purely random mutation is that the change in genetic complexity is coherent and beneficial to the organism or it is not, resulting in cancer. In order for random mutation to work there must be a slight bias in probable outcomes in favour of both an increase in genetic complexity and a coherent change in genetic structure resulting in a coherent change in the organism’s systems. However when one examines random mutation in nature such as with the AIDS virus or malaria cells, where random mutations occur quite rapidly, one does not get an increase in genetic complexity as in the case of the AIDS virus, but only a decrease in genetic complexity as in the case of malaria cells. Random mutation is actually heavily biased against coherent increases in genetic complexity, yet when we examine the genetic structures of living organisms we clearly see an increase in genetic complexity that is expressed at the macro level in terms of biological systems, physiology, morphology, and biochemistry! There is only one answer to this, non-random mutations are occurring by some unknown process! Random mutation’s heavy bias against increased complexity and for decreased complexity explains why viruses arose from bacteria and not bacteria arising from viruses, but it is inadequate in explaining the development of complex life forms. In addition to Dr. Denton’s book there is another book that postulates something similar. Life’s Solution: Inevitable Humans in a Lonely Universe by Simon Conway Morris. Life’s Solution builds a persuasive case for the predictability of evolutionary outcomes. The case rests on a remarkable compilation of examples of convergent evolution, in which two or more lineages have independently evolved similar structures and functions. The examples range from the aerodynamics of hovering moths and hummingbirds to the use of silk by spiders and some insects to capture prey. His new book, Runes of Evolution: How the Universe became Self-Aware, expands on his this theme with even more examples of evolutionary convergence supporting directionality in the evolution of life. Both of these books goes against the grain of Darwinian orthodoxy. So what does all this imply about alien life? 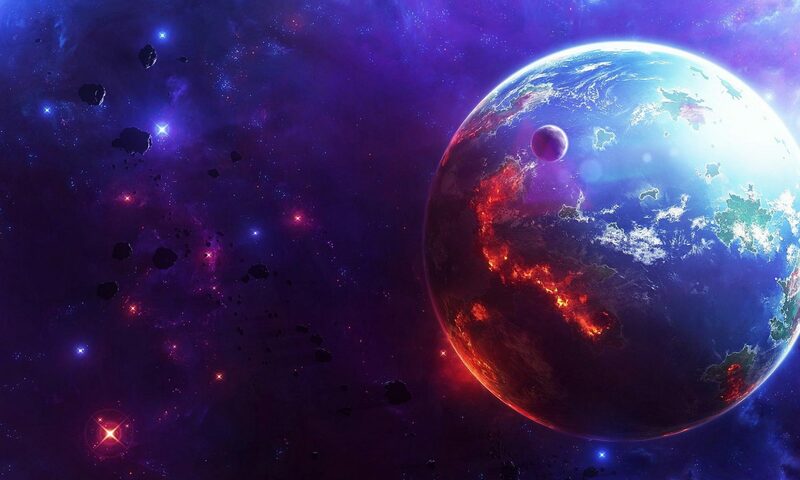 Simply this, the more Earth like a planet is, the more likely life will arise on it and evolve in a manner similar to that on Earth, both diverging and converging in patterns as seen on Earth, resulting in flora and fauna similar in morphology, physiology, and biochemistry as those on Earth. They need not be exact double gangers, but very similar to Earth life as depicted on Star Trek! In the new study, the researchers looked at all of the DNA sequences under positive selection (or those that help an organism adapt to its environment), to see whether they were near a repeated sequence. They found that 97 percent of the sites were. To find out if other DNA sequences that don’t undergo positive selection also mutate in this way, Garvin identified all of the repeated sequences in the DNA of the species studied. He found that 60 percent of all mutating sites were next to a repeat. “So in the end, most mutation is not random, at least for the DNA sequences we analyzed here,” Garvin said. Rather, it is a combination of two opposing forces — the mis-pairing during DNA replication and the need to preserve a protein’s function, Garvin said. The findings could explain why evolution occurs much faster than if mutations were, in fact, totally random, the researchers said. The repeated sequences may also be necessary for evolution, they said. I’m basically using the old genetic seeding trick with my own twist. But, besides the fact that they’re all human, I tried to make each of them diverse. Culturally, and some times physically. Like one of the subspecies I made, the Tenebri (pretty much everything is Latin). They’re human, but their planet only has suitable atmospheric pressure inside cavern systems below the surface. This effected eye sight, skin (okay, so I made human moles. Deal with it). There’s also the Aphrodites, which have a perfect biosphere, flawless biology. Their history doesn’t account for one person ever committing any kind of crime. That was before an asteroid swung past the planet and fucked up the orbital mechanics, but that’s besides the point. Anyway, the article was a good read, and was both entertaining and useful. Now I know which rules to contradict and follow.